GOP lawmakers — who were praised by conservative groups — said the bills would prevent Michigan from continuing to accumulate debt in the pension system and ultimately save more money for classrooms. But they acknowledged that Republican Gov. Rick Snyder, who is concerned about the upfront transition costs of closing the hybrid plan to new people, is still not on board after they met again Tuesday. The emboldened text is a fair truth. There is a bit of a spike in operational costs associated with such changes. Its been used as the boogeyman to slow the spread of this kind of common sense by retirement systems for some time. It was certainly presented to the Traverse Area District Library in that way 2 years ago as we were planning our transition. We completed this late last year, and will save county taxpayers Millions in the next few decades. The rationale for the spike is the decrease in contributions funding the retirement plan in total, while the retirement obligation to the municipality (or state) remains the same for a while. As an example and based on my experience, I have constructed a chart below which illustrates the timeline, and expected spike due to decreased contributions to the overall plan, and then the corresponding drop due to employees (eventually dying) falling off the obligation rolls. Note that initially, the cost is close to the same. New hires don’t require additional contributions, and unless there is a mass retirement immediately, existing DB employees continue to fund their own plans as before. Eventually, retirements of the DB employees causes the declination of overall employee contributions into the plan, requiring the government entity to make-up the difference. 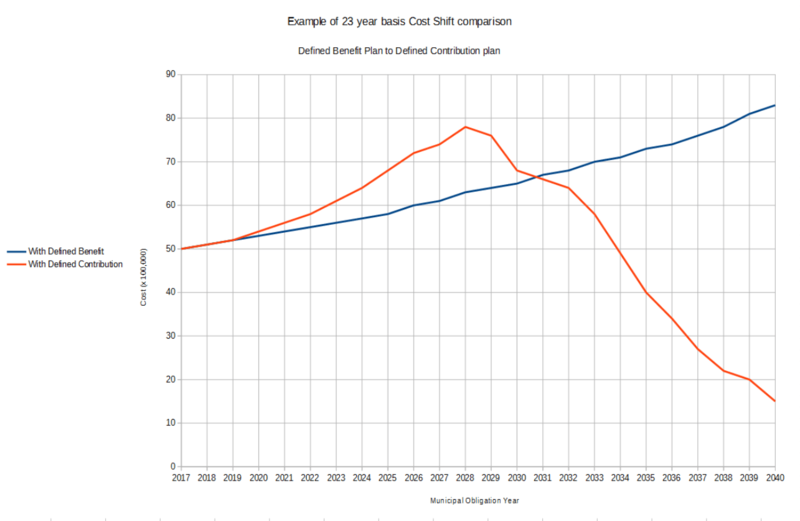 The cost (as seen with the red line) continues to increase until the DB employees start dropping off the rolls, because the liability for the funding remains with the institution that had the plan. It ultimately eliminates the overall liability to the taxpayer resulting in more predictable budgets, providing for good government. It also provides a way in communities can uphold easier, the state constitutional mandate of providing pensions as-promised, sans the threat of draconian cuts. The blue line represents a static employment number with a two percent average increase yearly in cost. (Cost of living increase) It remains on a slow but constant trajectory upward, and does not reflect the actual liability still being accrued (and usually under reported) to the pension plan. The state has this problem. For the Michigan Public School Employees Retirement System, we have been following along with the blue line. The line, as noted already, does not demonstrate any level of connection to the actual liability (debt) to the pension system however. As communities are finding out on a much smaller scale, pension promises that might one day be considered fully funded, are not as easily tracked and kept. Ask current Grand Traverse County Commissioners about how well its worked for them. Better yet, ask the 20+ year tax-and-spend veterans of that board like Larry Inman, Wayne Schmidt, or the last holdout Sonny Wheelock how well it worked for them. Michigan MUST swallow the pill now, and hope it is not too late. Pension reform is tough business. Its especially tough if the last stop on the reform train is reluctant at the get-go. But it needs to be done soon or we WILL face higher taxes, down the road. The bills that are being submitted now are a good step in addressing our long term liability. As the largest part of unfunded debt the state is carrying it would take a very large monkey off the backs of our children going forward. And its truly is about damned time. If the Guv is so concerned with the "upfront" costs associated with this transition, then he ought to show some leadership for a change (I know that this is saying a lot...but just humor me here) and veto somethings right here and now to free up some much needed $$$. He can first promise to veto the package of "Gilbert Bills" slated to come across his desk for his John Hancock in the coming days. Michigan Taxpayers already bailed out Detroit and Detroit Public Schools. We don't need to bail out Detroit businessmen as well. Speaking of giving money to Detroit businessmen who don't need any money (especially public money), he can put the kibosh on the $36-million in free money the MEDC is going to give the Illitch clan and their "little" Mom & Pop outfit on Woodward. This is on top of the millions they have already received. I'd also advise that he show some backbone and acknowledge the fact that Snydercaid's days are numbered. Reps. Glenn & Howell have already introduced legislation prohibiting adding any more people. If Congressional republicans don't want to get their collective clocks cleaned in '18, Obamacare repeal is coming, which also means that the kill switch built into Snydercaid also kicks in. Granted the deadbeats who want the rest of Michigan to pick up the cost of their health insurance will be ticked off, but look at all of the millions that can be freed up to be redirected right there! Could someone explain how/why taxpayers are on the hook for future shortfalls? We have made the necessary and mandated contributions and union actuaries have miscalculated the population trends. They haven't simply miscalculated, but have instead made the assumption that growth is perpetual and unstopping. The pensions were designed to require constant renewal with current funds. 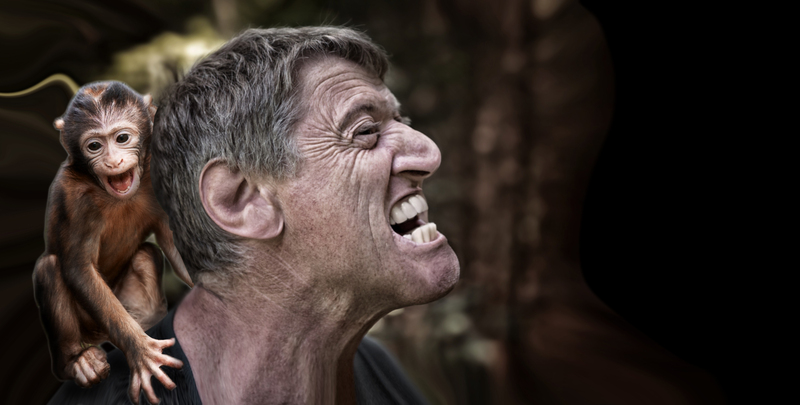 Escaping from the program was made to be intentionally painful and economically challenging. Taxpayers have received the services contracted for, so it may well be bad planning in the past, but it certainly remains our responsibility. Governor Snyder sent out his Budget and Treasury department flacks to heap vituperation on the 2015 Truth in Accounting analysis of Michigan's indebtedness and liabilities when some State Legislators started asking questions last year. As always, our media morons parroted the Snyder line without question and ridiculed these State Legislators for questioning the competence of state 'experts'. Some experts. Now the House Fiscal Agency has suddenly found it convenient to confirm in detail what Truth in Accounting found two years ago. Don't hold your breath waiting for any apologies. Michigan's experts never apologize, they just move on to create our next crisis. It is nothing short of incredible that the 2010 MPSERS reform could have already racked up $ 46.4 billion in unfunded liabilities, but it did. Continuing with the current MPSERS plans does not avoid the $ 46.4 billion unfunded liability, it just camouflages it and ultimately increases it. Perhaps our accountant-in-chief should review his accounting terminology. That $ 46.4 billion liability is a sunk cost. We cannot get it back, but we can prevent it from increasing. "This is the biggest vote of my career," [Chuck] Moss said after the debate. "We fixed the pension plan with its $45 billion in liabilities, capped the amount districts have to pay and were fair to retirees, It's huge, absolutely."